George contacted me about posting this again since it seems to still be a bit of a mystery! 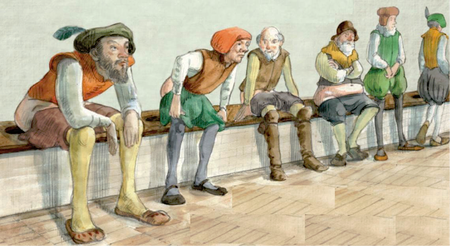 Below is an illustration from a lecture I Googled about the Great House, and I guess it's of men using that facility. Several questions: Were such facilities separated by gender, as this drawing suggests? By class? Note the absence of anything -- a cloth, a sponge, even water -- to wipe their bottoms. Can anyone comment on this as well as answer more completely my initial questions re: "toilet facilities" for large gatherings? In looking through a synopsis of David Stewart's lecture at Little Waldingfield History Society re: Hampton Court, the statement below appeared. It's in line with my questions about: how toilet facilities were available and serviced for large numbers of people? Were they separated by gender and/or class? How did they clean themselves? In light of inventories, descriptions of room use, servant assignments, and so forth, one would think evidence would be available. Today, a review of event plans and budgets would show evidence of toilet facilities, supplies, and services since costs, space, and labor are needed. Henry really used Hampton Court to impress, and in August 1546 he feasted and fêted the French ambassador and his entourage of two hundred gentlemen, along with 1,300 members of his own court, for six days! We actually have very little documentary information today regarding facilities for "the call of nature." The questioner cited modern "event plans and budgets ... supplies and costs" to which we can refer for information on modern public facilities. Extremely few such records survive from the Tudor period. More importantly (and maybe I am over-reading the question), in referring to "events," I understand the question to be related to what would today be called "public facilities" meant for use by large crowds attending some kind of short-term gathering. In actuality, there was no such concern for "the public" in the 16th century. There was nothing comparable to what would today be called "public utilities," such as municipal water supplies funded my local tax or rate payers that were built and maintained by local governmental authorities, as there are today. Neither were there road crews for the building and maintaining of public roads, nor police forces to ensure public safety, nor publicly-funded systems of transport, etc. And neither was there any publicly-funded and -operated entity that provided toilet facilities for large numbers of people. Where toilet facilities existed, they were provided by ... and for use only by ... the owner of a private residence. The owners of those individual private facilities did employ "night soil men" or "gong farmers" to remove human waste from the household, but those removal men were usually private entrepreneurs. Only rarely were they publicly-funded employees of a local council or government. Similarly, even the "municipal toilets" cited by Ian Mortimer were situated on London Bridge, which was itself entirely covered with buildings of various kinds in the Tudor period and not an open thoroughfare as it is today. Any "municipal toilet" on London Bridge, or any similar facilities situated on or adjacent to other waterways, were almost certainly operated by enterprising individuals and required some kind of usage fee ("farthing a fart"? ... sorry, couldn't resist). Those who could not afford the fee simply made do (pun intended) in whatever way they could, including eliminating in the street. Heck, I am old enough to remember when many "public toilets" in the US required the user to deposit a nickel or a dime in a mechanical device to unlock the door and to gain access to the "public" toilet! But I have not seen one of those in 40 years! And remember, the Great House of Easement at Hampton Court Palace was part of a private home, despite the fact that large numbers of people were housed in the Palace, worked there, and came and went to and from there on daily business. Further, Hampton Court Palace was a permanent structure, not part of some temporary "event." For genuine public events (e.g. : jousts, beheadings on Tower Hill, public pageants, etc), there were no "public facilities" provided. One did as best as one was able, wherever one was able. England was a smelly place in the Tudor period, and the total lack of attention to public sanitation contributed greatly to the disease and high mortality rate that prevailed during the period. Anecdotally, I can say that after touring dozens and dozens of Tudor-era castles, houses, cathedrals, monastic buildings, and other structures in which large numbers of people might regularly gather, I cannot recall even once seeing what could be described as a "public convenience" surviving from the Tudor period that was intended for use by large numbers of people. One does see numerous individual or small "garderobes" intended for use by no more than one or two people at a time, but nothing at all like what is depicted in the illustration. The "Great House of Easement" at Hampton Court was one of only a mere handful of such facilities. By and large, people out and about from their homes were left to their own devices when it came to the call of nature. I had forgotten all about the "pay to poo" facilities of my youth. Imagine the desperate dance while fumbling for change. I think the fact that many desperate and or poor people either climbed over or under or did damage to doors led to the end of the short lived business venture. I'm sure the stench and disease of the pre public sanitation in cities is unimaginable to us now except in disastrous cases,for example the New Orleans Superdome during the five days 16,000 were trapped without sanitation as well as other supplies during Hurricane Katrina. That was more extreme but short lived. In pre public facility cities they also had rancid meat, dead and live animals as well, the latter contributing to the sewage. Although as humans we seem to become accustomed to almost anything so I'm sure few gave it much thought except those coming newly from relatively more sanitary rural conditions.